Description: Battenkill Canoe LTD is a business categorized under canoes, which is part of the larger category boat dealers. 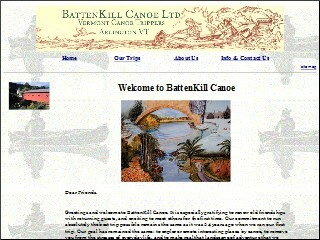 Battenkill Canoe LTD is located at the address 6328 VT Rte 7a in Arlington, Vermont 05250-8429. The Owner is Jim Walker who can be contacted at (802)362-2800. Location & access map for "Battenkill Canoe LTD"